Last summer, British telecommunications company Vodafone deployed a recharging truck to music festivals to enable festival-goers to charge their gadgets. Now, the company is rolling out a new piece of technology — also aimed at the festival crowd — that will let you charge your phone with your own body heat. The company just unveiled the “Recharge Sleeping Bag,” a prototype of a sleeping bag that can harvest thermal energy from body heat and use it to charge your phone. 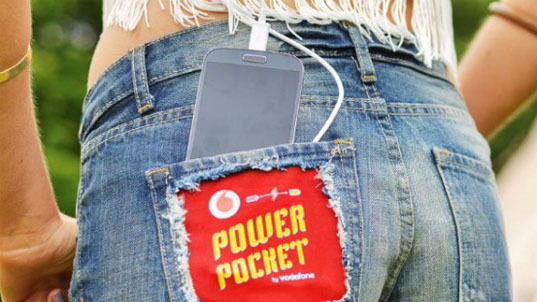 The sleeping bag isn’t the only energy-generating device that Vodafone is developing; the company also rolled out the Power Shorts, which can charge your gadgets by harvesting kinetic energy. The shorts can generate energy from dancing, and use that to keep your phone powered up. Vodafone worked with the Electronics and Computer Science Department at the University of Southampton to develop a thermoelectric material that’s small enough that it can be stitched into a sleeping bag or a pair of shorts. “Basically, we’re printing down pairs of what are called ‘thermocouples’,” explains Stephen Beeby, Professor of Electronic Systems at the University of Southampton. “You print lots of those down and connect them up to make a thermoelectric module. The energy generated by the Recharge sleeping bag might not be enough to fully recharge a phone — according to Vodafone, eight hours in the sleeping bag will translate to roughly 24 minutes of talk time — but it will provide enough juice to make a call or two to meet up with your friends. The sleeping bag and shorts aren’t for sale just yet, Vodafone will debut them at the Isle of Wight Festival in England later this week. Last summer, British telecommunications company Vodafone deployed a recharging truck to music festivals to enable festival-goers to charge their gadgets. Now, the company is rolling out a new piece of technology -- also aimed at the festival crowd -- that will let you charge your phone with your own body heat. The company just unveiled the “Recharge Sleeping Bag,” a prototype of a sleeping bag that can harvest thermal energy from body heat and use it to charge your phone.